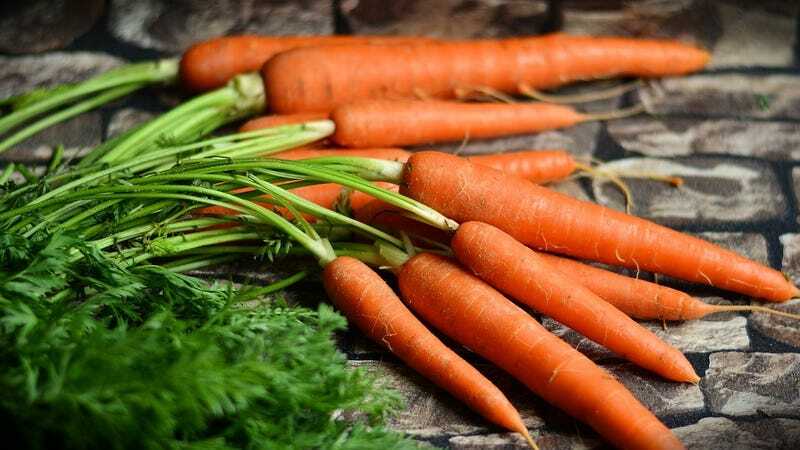 Veggies like carrots are good for you, but please don’t rely on them to treat cancer. Over the past few weeks, multiple media outlets have written about Kathy Bero, a 54-year-old woman who claims her breast cancer 12 years ago was ultimately defeated through a special diet and diligent use of reiki, an alternative medicine that purports to treat disease via healing energy channeled through a person’s hands. Her recovery was so miraculous, these articles have credulously reported, that Harvard scientists are gearing up to study how Bero’s diet saved her from cancer. But that’s not what’s actually going on. Bero says she was diagnosed with breast cancer in 2005, and that despite the standard treatment of surgery, chemotherapy, and radiation, the cancer was persistent. Eleven months after her initial diagnosis, she says a second late-stage tumor was found in her neck and head, and she was given 21 months to live. Sick of the side effects of chemotherapy, Bero says she decided to go off it completely. Instead, on the advice of her friend, Bero says she went on an anti-angiogenic diet, meaning she would mostly eat foods claimed to prevent tumors from creating the new blood vessels (angiogenesis) needed to fuel its growth, such as carrots and purple potatoes. According to Bero, the new diet, coupled with her using reiki, meditation, and guided visualization, successfully cured her cancer when nothing else could. Bero (and her genes) are indeed part of an ongoing study by Harvard researchers and others, led by Isaac Kohane, chair of the Department of Biomedical Informatics at Harvard Medical School. But the scientists aren’t, as recent articles have proclaimed, “studying her approach” to treating cancer through diet. The study, according to Kohane, is a excavation of sorts. They plan to look at the genetic makeup of people like Bero who have had rare, extraordinary recoveries following their cancer diagnosis. These subjects will mostly be people who have responded much better than expected to whatever treatment they were given. But the study will also include people like Bero whose cancer went away seemingly out of nowhere, a phenomenon known as spontaneous remission. “The purpose is to look, in an unbiased way, across all different measurements, what might explain these exceptional responses,” Kohane told Gizmodo. He declined to speak about Bero specifically. That’s certainly a worthy goal, but notably, it has nothing to do with endorsing anyone’s claims of using a diet to beat their cancer. And there are plenty of reasons not to buy into that narrative. Last February, for instance, the family of Mari Lopez, a famous YouTuber who claimed she had treated her breast cancer through a raw and vegan food diet, reported that she ultimately succumbed to the disease. Other times, as was the case with 25-year-old Australian Belle Gibson, the claim turns out to be nothing more than a scam. Gibson was ultimately fined over $320,000 last year for perpetuating a series of cons related to her claimed cancer recovery, which included failing to donate the proceeds from an app and cookbook that would teach others how to follow her life-saving lifestyle. Gibson never actually had cancer. That doesn’t mean that food can’t play a role in cancer. We certainly suspect that a healthier diet can lower cancer risk, though the evidence is less concrete than you’d expect. Lifestyle factors influenced by our diet, like obesity, can raise cancer risk too. But there’s no solid research that food alone can treat someone’s already developing, aggressive cancer (using drugs to directly stop angiogenesis in tumors to shrink them is a mainstream treatment, though), nor that reiki—a pseudoscience so ludicrous that a 9-year-old girl was able to debunk it 20 years ago—can do the same. Media outlets that have failed to include this important context in their stories about Bero and the Harvard research are doing a disservice to their readers and possibly giving false hope to cancer patients and their families who might try to follow in Bero’s footsteps. The very point of Kohane’s research is that we don’t know why she and others were able to recover from cancers when many others in their shoes don’t. And until we do, it’s dangerous and wrong to imply otherwise.